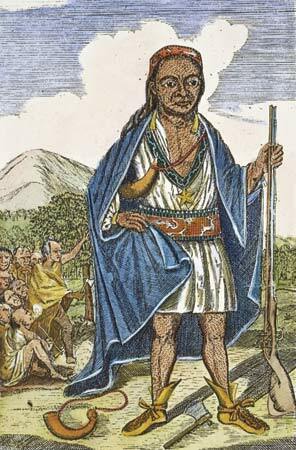 Metacom, called “King Phillip,” by the English became sachem of the Plymouth area tribe in 1662. Metacom, or King Phillip as he was known by the English, was chief of the Wampanoag in southeastern Massachusetts. Apparently a charismatic personality, Metacom was able to leverage seething resentments. The spark that set off the war was Metacom’s contention that the English had murdered his brother. The underlying causes were the Indian’s fear of the never ending pressure to sell their land (a concept which was more English than Indian anyway) and increased dependence on trade goods from the new comers. meanwhile the Indian population in New England as a whole had declined to about 10,000. The flintlocks, steel knives, copper pots and other trade goods (colonists were forbidden to sell liquor or guns to the Indians but somehow it happened) were requiring more and more deerskin and beaver skins — which were becoming harder and harder to find. -the war (paid for by the Colonials) cost 100,000 pounds – a huge sum at a time when most families earned less than 20 pounds/ year. Metacom and his allies (the Mahicans remained allied with the English) raided up and down the Massachusetts part of the Connecticut River Valley and the towns too small to defend themselves were abandoned. About 600 colonists died, but the impact of the war on the Indians was catastrophic. The already diminished Indian population was – by some estimates – reduced by 60-80%; 2,000 killed, 3,000 felled by disease, 1,000 sold into slavery, 2,000 fled north or west (although not too far west – these largely Algonquin tribes were long time enemies of the Iroquois in New York). Destruction included leveling most of the nascent community of Springfield and ambushes around Deerfield that led to its temporary abandonment. Jonathan Hinsdale’s grandfather was among those killed in the Battle of Bloody Brook while trying to deliver a grain harvest from Deerfield to Hadley. -increased sense of independence – the newly restored Charles the II had no sympathy for the Puritans who had deposed and executed his father so the Colonials were limited to their own manpower and resources to respond to the threat from King Phillip.